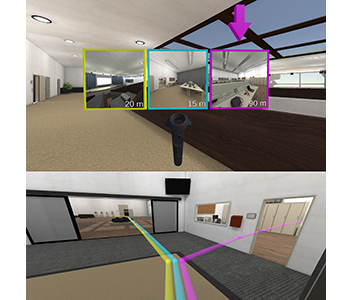 During free exploration of an unknown virtual scene, users often miss important parts, leading to incorrect or incomplete environment knowledge and a potential negative impact on performance in later tasks. This is addressed by wayfinding aids such as compasses, maps, or trails, and automated exploration schemes such as guided tours. However, these approaches either do not actually ensure exploration success or take away control from the user. Therefore, we present an interactive assistance interface to support exploration that guides users to interesting and unvisited parts of the scene upon request, supplementing their own, free exploration. It is based on an automated analysis of object visibility and viewpoint quality and is therefore applicable to a wide range of scenes without human supervision or manual input. In a user study, we found that the approach improves users' knowledge of the environment, leads to a more complete exploration of the scene, and is also subjectively helpful and easy to use.